JOIN US FOR THE NEXT EXHIBITION OPENING! Woo jung KOH was born and raised in Korea. Koh's work focuses on the relationship between modern society and her emotional state, while thinking about the inner psychological aspects through facial expressions, gestures, staging and disfigurement. While focusing on the self-portrait and expressions, she went through different states of coexistence, process, isolation and reflecting on self-portraits of emotions through her past works, which became an important process to her current work. Koh enjoys observing body language and facial expressions and this has become enhanced since living in a foreign country. This has caused her to think more about expression and is found as the main subject in her current body of work, including faces and bodies as the key elements of expression. 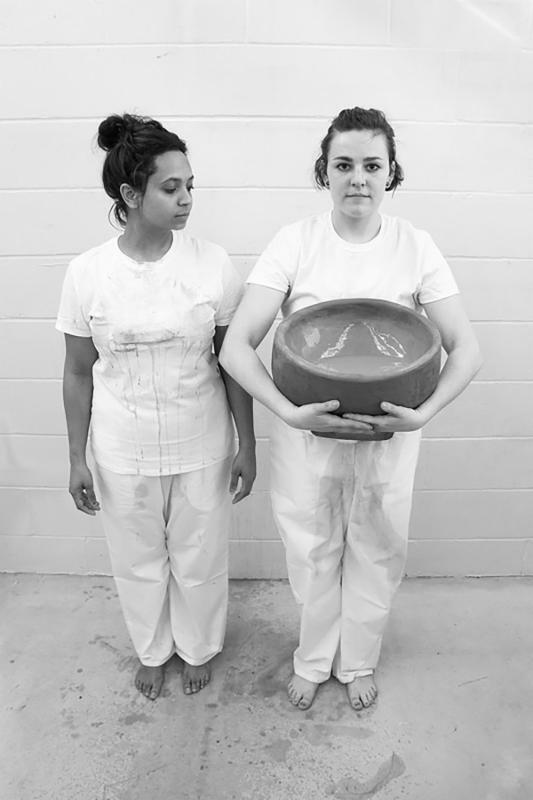 Emily Irvin's work focuses on the ritual actions and mundane objects involved in caring for the body, in an effort to highlight the purification and healing capacities of bodily care. She explores care by breaking down its binaries and observes care occurring in positive terms as comfort and support, and in negative terms as constriction and stress. Irvin's creation of multiple similar objects and actions has led her to understand that observing subtleties and nuances informs her process of exploring, expanding, and breaking down the ecology of care. GIVE TO OUR CAMPAIGN TO RAISE $50,000! BE ONE OF OUR 'LIFE PRESERVERS'! Since our campaign launch, Baltimore Clayworks' has raised $5,695 from 18 generous donors, who are supporting us during this critical time. We are deeply appreciative of the contributions so far, however we still need to reach our goal of $50,000 as soon as possible. Give today! Your contributions will directly support immediate expenses this summer, which includes paying our hard-working staff, teachers and artists along with covering expenses for materials and supplies for adult and youth programming in Mt. Washington and at our community sites across the city. Whether you can give $25, $50, $100, $500 or $5,000, every dollar counts during this time. Your support now will ensure our mission-driven programming over the next few months and into the future. Thank you! DON'T FORGET TO SIGN UP THE KIDS IN YOUR LIFE FOR CLAY CAMP! Week-long camps have started and run all summer. There are still seats in many of the camps - sign up today or call 410.578.1919 x210 to find out more about each camp! Half Day camps for teens ages 12-15. Sign up for more than one camp & get a Multi-Camp Discount! Check out the full list of camps today!